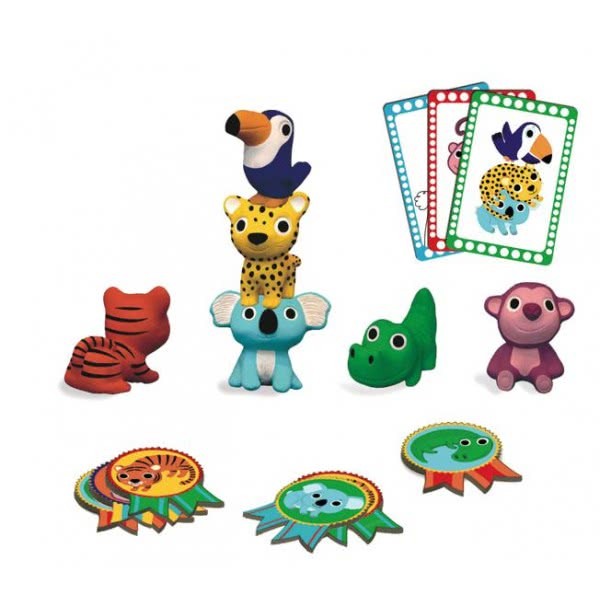 Little Action from Djeco is a superbly crafted interactive game for little ones from 2 1/2 – 5 years of age that gets them throwing, balancing, aiming and catching the six little animals in the box. Children need to follow the visual instructions on the action cards. If they succeed they win a medal. When all the action cards have been used up, the player with the most medals is the winner. So much learning through play – exactly the way it should be! Challenge 1: Stacking. Stack the two animals shown in the picture on top of each other. The stack must balance for at least 30 seconds to count. Challenge 2: Throwing. Place the box lid at least 20cm away from the player. They have to throw the animal depicted on the card into the box, developing their aiming and estimation skills. Challenge 3: Balancing. Take the animal shown on the card and try to balance it on your head. It must stay in place for 30 seconds to count. Challenge 4: The carousel. Take the animal on the picture and try to pass it three times around your body without dropping it. Challenge 5: Aiming. Balance the two animals shown on the card on top of the box lid which is standing on its side 20cm away from the player. Take another animal, throw it and try and knock down the two on the box. Challenge 6: Throwing and catching. Take the animal shown on the card and throw it up into the air with one hand, then catch it using the same hand. Little Action is a huge amount of fun and the animals themselves, which are such an attraction to children, can be used for fantasy play activities. 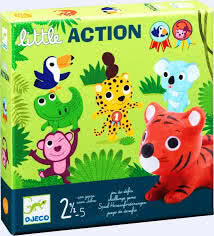 Djeco’s Little Action game was reviewed by Nikki Bush for Toy Talk.